For outdoor enthusiasts, this is the perfect gift for yourself or for a friend this Christmas and if you buy them together you get 15 dollars off! That’s a sweet deal. I acquired the kettle a few months ago and was able to use it in one of my treks to Benguet. The stove and kettle were solid performers in the cold mountain. My group enjoyed staying around the stove to keep them warm. The kettle was perfect for cooking and boiling water. The kettle is made of tough stainless steel and it includes a plastic bowl. The cover with the spout provides an easy way of pouring hot water or soup without the mess. The only gripe that I have for the whole system is the weight. I will need a porter to bring these and my other stuff. 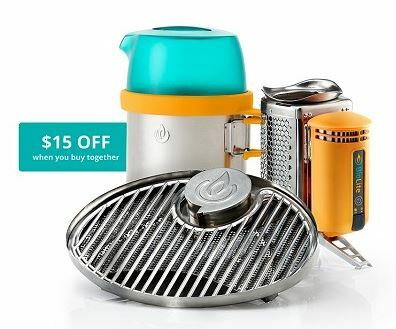 For family outings and picnics, the Biolite Camping Stove System will be perfect. I can already imagine the look on the faces of people who will see this hahaha (talk about being a proud owner). For my other reviews of the Biolite Camping Grill and Stove please click HERE and HERE. For more information about the Biolite Camping Stove System visit their website HERE.